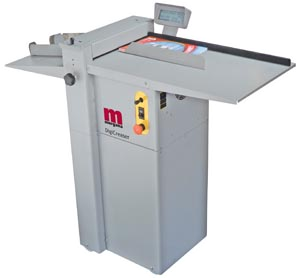 The Morgana manufactured DigiCreaser fills the gap between our manual machines and fully automatic machines like the best selling AutoCreaser Pro range. Traditional rotary scoring machines use circular blades that are in constant motion as the stock passes through them. This creates a ploughing action that actually cuts through the top fibres of the paper or card in order to create a score. Inevitably this weakens the paper and encourages cracking. In contrast, the Morgana DigiCreaser employs a unique creasing rule and matrix as illustrated overleaf, that eliminates tearing and, therefore, cracking. Whilst it’s cost is little over half that of an AutoCreaser, it offers exactly the same creasing quality and accuracy. This is because it uses an identical matrix and rule action, with the same technology to control both the positioning of the creases, but also to give a completely consistent creasing depth. With the rule and matrix manufactured from high quality tooled steel we can guarantee this mechanism for life. In instances where the crease has to be set to an image which is not correctly registered you can swing the rule/matrix mechanism to compensate. The speed at which the sheets are taken into the in-put rollers can also be adjusted. The DigiCreaser is no slouch when it comes to productivity. All functions are fully automatic after feeding and the unit can operate at speeds up to 4,000 sheets per hour. Up to 9 creases can be achieved in one pass and the sophisticated controls enable jobs to be stored and retrieved for repeat work. The class leading specification of the DigiCreaser includes a maximum sheet size of 24.8″ x 12.9″ and it will handle weights of stock up to 0.015″ (approx 150lb cover)* including laminated material. The DigiCreaser has a Head-up display for greater ease of use. This is particularly intuitive as it provides the operator with a series of prompts which are actioned by a single controller. These include positioning of the creases, setting the speed of the machine, storing jobs and counting facility. Standard features includes the same high quality perforating as the larger AutoCreasers. The perforating wheels are available with a variety of teeth to suit all applications. The DigiCreaser can be supplied as either a bench top or floor standing model.